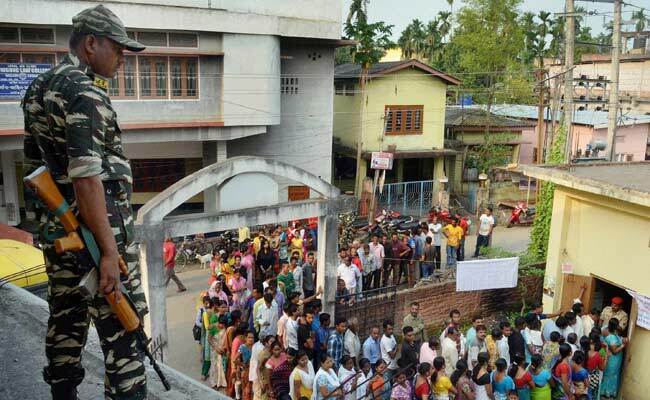 Guwahati: The by-election for Dhemaji legislative constituency in Assam began this morning where a straight contest is on between BJP's Ranoj Pegu and Congress' Babul Sonowal. The by-poll was necessitated to the constituency following the election of earlier BJP MLA Pradan Baruah as MP from Lakhimpur Lok Sabha seat after Assam Chief Minister Sarbananda Sonowal left his parliamentary seat. "The polling has begun at 7 AM. Everything is going smoothly as of now and we hope that maximum number of people will take part in this exercise," Dhemaji LAC Returning Officer Roshni Aparanji Korati told PTI. The counting will take place on April 13, said Ms Korati, who is also the Deputy Commissioner of Dhemaji district. A total of five candidates are trying their fortune in this poll with the main contest likely to take place between BJP's Ranoj Pegu and Congress' Babul Sonowal. The other three candidates are CPI(M)'s Jadu Hazarika, SUCI(C)'s Hem Kanta Miri and Independent Rajkumar Doley. The constituency has a total of 2,19,751 voters, of which 1,12,510 are male and 1,07,241 are females. The elections are being held at 273 booths and authorities have earmarked 20 as very sensitive polling stations, while 141 are sensitive.